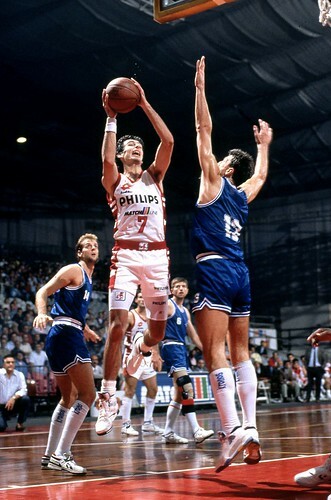 Riccardo Pittis, a product of the Milano’s youth system, to become a great player had to overcome a cardiac malfunction at birth and eventually a right hand injury that forced him to shoot free-throws left-handed. But at that time he had already moved from Milano to Treviso, a dominant club of the era. The first Pittis was a different player from the last version. MIlano’s Pittis was a perimeter guy, with a great ball-handling, athletic, defensive oriented and a good shooter. His coaches dreamed about making him a 2-meter point-guard. Peterson thought of him as the Italian Magic Johnson. Pittis became early a top team rotation player. He was decisive at 18 in the finals series against Caserta completing the Peterson’s Grand Slam of 1987. Olimpia was short of energy by the time it had to play Game 3 of the Finals, in spite of being up 2-0. Caserta, very young and courageous, took a 19-point lead early in the game, feeling a sensational rally. Peterson, desperate, sent Pittis on the court. He made two threes, stole a ball, scored 10 points and ignited a furious rally to lead Milano to the win and the championship. One year later he became important in the Champions’ Cup triumph. Then he won another Italian championship in 1989, helped the team moving to the next D’Antoni-led era, moving gradually to a position closer to the basket, his natural position in Treviso, where he arrived in 1993.